Brasov, lies in the centre of Romania, in the south-eastern area of Barsa depression and at the crossroads of the Middle Carpathians and the Western Carpathians and it is at 550-650 m. above sea level. It is considered the fifth largest city in this country and it is 160 kilometres away from Bucharest, the capital city and the main city of the Romanian tourism. The origins seem to be lost long ago in history: the first document dating from 1235 mentions - Corona - (the ancient name of Brasov) and refers the beginnings of the medieval city. 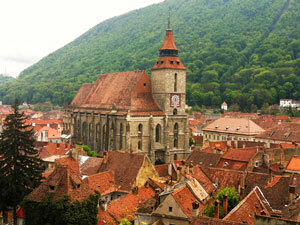 In 1228 Brasov was known bythe name of „Brasso“ and the actual name of - Brasov - appeared only in 1324. During this period, Brasov was known as a powerful fortress surrounded by high stone walls and defended by bulwarks, towers and other small fortresses, every group of craftsmen in the city being charged with the defence of a certain bulwark or tower. One can still see and visit today some of the old fortifications in the city. The buildings and the streets in the historical centre still preserve a medieval ambience and they are a favourite tourist attraction. The houses built in the 19th century display artistic elements belonging to the Art Nouveau, the Neo-Renaissance or the Neo-Baroque styles. Brasov can be proud of having the first chemist’s shop in Transylvania dating from 1514; tools belonging to it are still preserved today in the collection at the History Museum. The first studies in Medicine in Romania were also written in Brasov: A Medical Treatise on Plague by Dr.Pauschner in 1530 and SanitasStudium by Dr. Paulus Kyr in 1551. Brasov also had a well-known mint dating from the 15th century, where different kinds of money were coined (golden florins, dinars, silver guilders and golden ducats). The mint’s symbol was the crown with scattered branches which was also the symbol of Brasov. Due to its dimensions (over 89 m. In length), the Black Church is the largest gothic church between Vienna and Istanbul. From 1385 from the process of building the church until 1477 were was finished and up to 1689 when it caught fire, the name of the church was St. Mary’s Church. 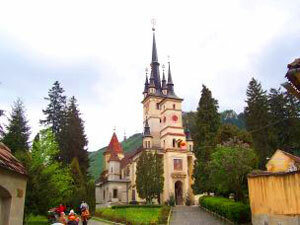 Due to the dark colour of the burnt walls, it was called the „Black Church“ and it is one of the most visited tourist attractions of Brasov and Transylvania. 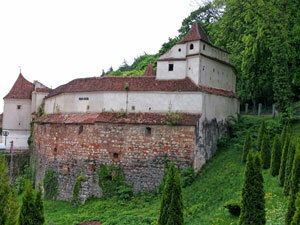 Built in 1524 on a hill near the old fortress, the Citadel was an observation and military outpost. One can visit it nowadays, being one of the most famous restaurants preserving a mediaeval ambiance. An excelent panorama of the city may be admired from the walls of the Citadel. The building process began in 1524 originally a wooden fortress surrounded by moats. In 1553 the Citadel got its present aspect and in 1630 four bulwarks were added to the building. The Citadel was the main stronghold of the rebels in 1688. Hirscher House lies in the City Council Square and it was built between 1539 and 1545 in the Renaissance style, serving to market the craftsmen’s products, being also called „the Merchant’s House“. Nowadays modern trade galleries and restaurants may be found here. The Weaver`s Bulwark - is considered a unique construction of this kind in Romania and it is the only which still preserved its original form. It is situated in the southern part of the Fortress and it was built in two stages: between 1421 and 1436 and between 1570 and 1573, being rebuilt in 1750. It has a hexagon shape and it is protected by walls 2 to 4 metres thick. 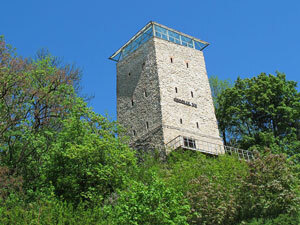 Being an important strategic point it has a tower gate and two observation towers. This bulwark belonged to the linen weavers guild and it was used for teaching the apprentices, for meetings, for keeping documents or for military training. Inside there are galleries floored on 3-4 levels and with shooting holes. There are also some living spaces for the ceremony hall and the guard`s family. Nowadays the Weaver's bulwark houses a section of the History Museum - that is "The Fortress of Brasov and the Fortifications around Barsa region". Inside the museum there is a replica of the old city with all its buildings and fortifications. In summer, classical music concerts and other cultural events take place here. In order to prevent enemy attacks, 28 towers were built in a square plan around the fortress (as part of the fortress itself) and 4 exterior towers, two on Warthe Hill (the White Tower and the Black Tower) were built and other two on Tampa Hill. These towers had also an observation role. One can still visit two of these towers. Built in 1494 on five levels and having a horseshoe shape - is situated on Warthe Hill, 59 metres far from the walls of the fortress and around the Graft Bulwark to which guards could connect with the help of a drawbridge. The Tower is 14 metres high and its walls are 4 metres thick and it has floored galleries inside and firing vents. The Tower was destined to the coppersmiths. The last restoration took place in 2003. 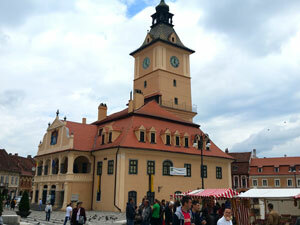 One can admire the historical centre of Brasov from a terrace situated next to the White Tower. Built in the 14th century is square-shaped and it is 11 metres high. 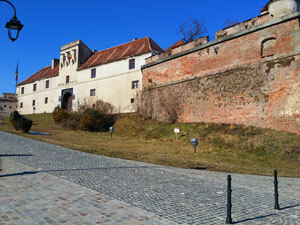 It is situated on Straja Hill next to the Blacksmith`s Bulwark. Just like the White Tower, it has floored galleries and three rows of firing vents for defence and a connection system to the fortress consisting of an underground tunnel. Its present name is connected to the 1559 fire which blackened its walls. The tower was last restored in 2003. Inside the Tower there is a section of the history Museum, and one can have an excellent view of Brasov on the last floor. Nowadays, the route bringing together the walls of the fortress, the White Tower and the Black Tower is a favourite place for walking. 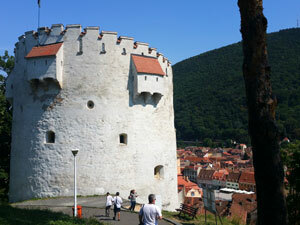 One can admire the historical centre of Brasov from a terrace situated next to the White Tower. 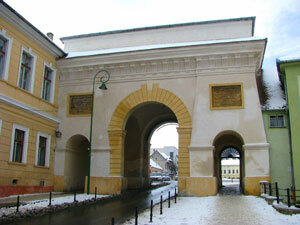 The Schei Gate was built in 1827 having the shape of an arch of triumph. Its role was to support the access to the city and to link the "Schei" district to the Fortress. The Gate was built in the Classical style, having three openings: two lateral for pedestrians and a central one for vehicles. The Latin inscription, still visible today, reminds of Emperor Francisc I`s visit. Ecaterina`s Gate situated near the Schei Gate in the western part of the Fortress was built in 1559 in the Renaissance style. It has a sharp tower and four little towers, symbolizing the medieval right of life and death over the vassals` lives (the right of the broadsword). The gate also had firing vents, a drawbridge with chains, being one of the most fortified gates of the city. Above the portal one can notice the escutcheon from 1559. 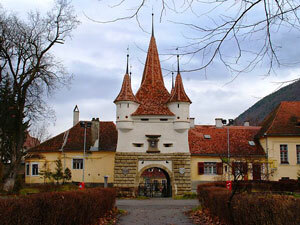 Ecaterina`s Gate, defended by the tailors` guild is the only medieval gate which is still preserved today. The Fortress of Brasov had much more gates such as the "Gate of Gates", the "Black Gate" or the "Monastery Gate" which no longer exist. St. Nicholas` Church was the first Orthodox stone-made church in Brasov and it was built in 1495 with help from Moldavia and Wallachia. Just like other religious buildings, the church is surrounded by defence walls, the inside being decorated with frescos by CostinPetrescu. The architecture reminds of the Gothic, Baroque and Renaissance styles, being in fact a synthesis of these and other Byzantine influences. The church houses a valuable collection of paintings and icons, liturgical objects, and a set of documents concerning the permanent diplomatic relations with the other Romanian counties, the first chronicles written in Romanian, the first Romanian printings by Coresi the Deacon. Some of these are exhibited in the museum opened inside the First Romanian School. In the yard one can also discover a small graveyard where famous people in the history of Brasov and Romania as well are buried. NicolaeTitulescu`s tomb, a remarkable Romanian politician, stands out among these tombs. 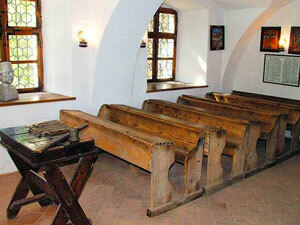 The First Romanian School was founded in 1495 under the high patronage of St. Nicholas` Church. Romanian diplomats and ambassadors in the Balkan countries and in Western Europe were recruited here. Father Bratu - the writer of the first document written in Romanian - also learnt at this school. Coresi the Deacon, who had come from Wallachia to Transylvania, in the "Schei" district, published the first books in Romanian. 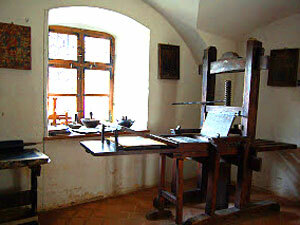 The manual printing machine used during that period, is still preserved. The building reminds us of the Baroque style. 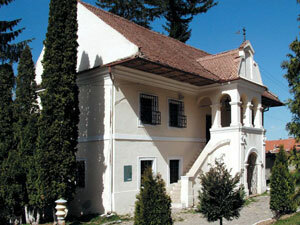 The Etnography Museum and "Nicolae Titulescu" Museum may be found here nowadays. The museum hold now a huge collection with more than 30000 old documents (the oldest one dating since 12-13th century).